Newcastle resident Ann Ranlett is an award-winning artist & illustrator who focuses on pet, animal & nature subjects rendered in scratchboard, watercolor, pencil or mixed media. Ann’s scratchboard drawings are finely detailed and realistic. 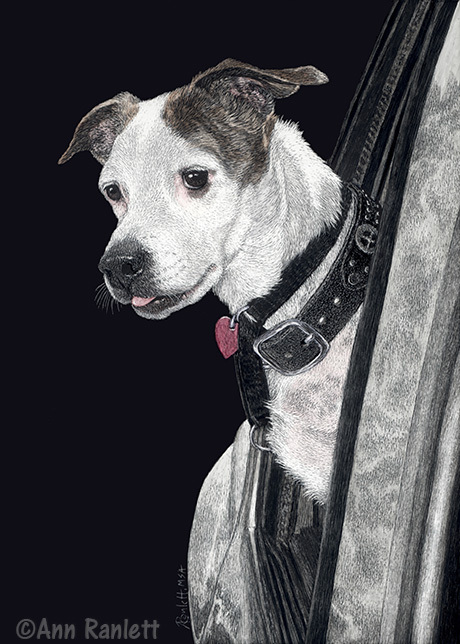 She accepts commissions for pet & animal portraits and nature illustrations. Ann is also a photographer – looking for unique perspectives of the natural world and taking the majority of her own photos for drawing reference. A graduate of CSU, Sacramento, with a bachelor’s degree in biology, Ann is a Master member (MSA) of the International Society of Scratchboard Artists (ISSA) and an associate member of the Society of Animal Artists (SAA). At Open Studio and other art-related events, she offers demonstrations of her scratchboard techniques and discusses her work. Ann also teaches scratchboard workshops and was a featured presenter at the 2012 – 2014 & 2018 ISSA workshops. Ann’s love of animals is a large part of her life. She supports a number of local animal rescue organizations and they are often a source of reference photos. She donates a portion of the sales of her art to these groups.